:As followers of Christ, we are encouraged to put our trust in the Lord and lean on Him under all circumstances. When we put our complete trust in the Lord, we remember that the Lord cares for us, even during the trials and tribulations that we currently face. The Trust In The Lord Tote Bag comes in a deep, dark coffee color and features Proverbs 3:5 in bold white, surrounded by a border of leaves. 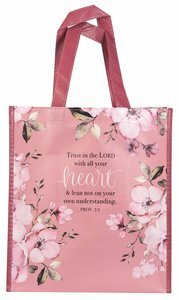 About "Non-Woven Tote Bag: Trust in the Lord, Pink Floral (Proverbs 3:5)"